Desperate for a utility room but don't have the space? Hate the sight and sound of the washing machine? There are tons of ways to banish your laundry room to even the tightest of cupboards. Don't believe us? Check out these clever small utility room ideas. Have a read of our how to plan and design a utility room too, for loads more practical advice. The alcove/niche/cupboard you can fit a utility room into can be super narrow if you only want to house a washing machine. A great small utility room idea is to pack all your storage on the wall above you washing machine so you don't take up any of the limited floor space. The space below the stairs in the hallway is usually a decent enough size to house at least a washing machine and perhaps even a condensing dryer, too. Maximise the space with a small utility room sink, a ventilated hanging area for drying or airing clothes and plenty of stack space for folded clothes. Doors can be left open while you're out or you can invest in a small dehumidifier to keep the area dry. If you would rather keep your space for storage, go and check out our under stair storage solutions for loads more ideas. Not just a great way to get the washing machine out of sight, a floor-to-ceiling cupboard in a corner of your kitchen, is practical small utility room idea too, allowing you to stash everything from appliances to hanging space to the ironing board in one compact space. Got some space to spare in your hallway upstairs? It's the perfect place for a small utility room because all the laundry stays upstairs, all the time (except when you're wearing it), plus you can have it built with some stud partitions at a very affordable price. Ensure you choose a super-quiet washing machine if you're putting a machine upstairs, have children and tend to wash at night. Otherwise, wash while you're out. Looking to invest in a new quiet washing machine? We have picked the best out in our round up of the best quiet washing machines. Why not make like the Europeans and put your utility area in a larger bathroom or shower room? It makes perfect sense: great ventilation, it's often where the laundry basket's kept; plumbing and drainage in place. What's not to like? You get dressed and undressed in your bedroom, so why not? Got a dressing room? Even better. Just ensure ventilation is really good so that drying clothes don't cause a damp atmosphere that the rest of your wardrobe won't thank you for. Got a niche for a small utility room but no space for doors to open out or fold back against the wall. 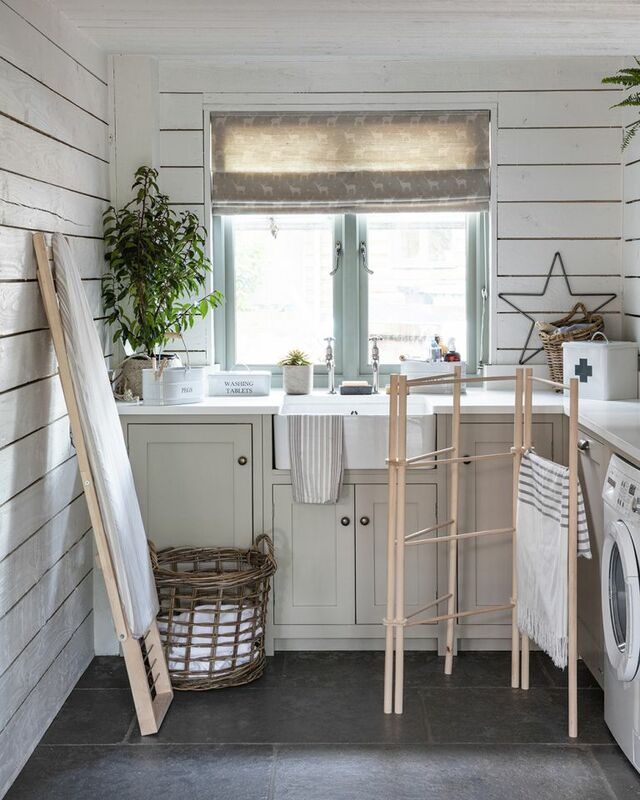 Take inspiration from this small utility room idea and instead of resigning yourself to an on-show utility, put sliding doors right across the front, just like Instagrammer The House in the Hollow. Wherever you're putting your utility space, whether into a run of kitchen units or in a run of fitted wardrobes, placing the washing machine off the floor in a sturdily built frame will mean you don't have to bend every time you load and unload it. Pull-out shelf for the basket beneath? Don't mind if we do. If you are just after a space in your home to store your laundry, do the ironing and fold your clothes, maybe you don't need built in cupboards or secret sliding doors. Create a work station from furniture you already have, stash some laundry baskets underneath, add some pretty wall-shelves for your detergent and what not, and there you go and makeshift mini 'utility room'.